I haven’t gotten around to gardening this year, but my unkempt vegetable patch has already expressed itself in a riot of deep-green mint. 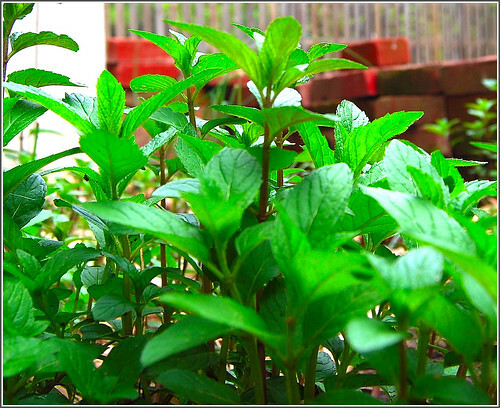 Mint’s one of my favorite herbs, and one that I use most often in my Indian kitchen, after coriander or cilantro. Luckily for me, it is likely also the easiest herb to grow, and returns year after year with almost no tending. By spring I already have armfuls I can pick and toss into anything I please. Mint’s also one of the most versatile herbs around: it’s great in sweets and spicy dishes alike. Regular old black tea turns into an extraordinary treat when you dunk in a crushed mint leaf. And who doesn’t love a mojito? Or two? Mint’s also good for you– its cooling properties make it the perfect summer food. 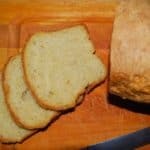 It aids digestion and is a great breath freshener. I use mint lots of different ways in my cooking: I use it as a garnish for curries. I zap it with silken tofu, salt and lemon juice in the blender for a cooling raita. I mix it up with some nuts, garlic and olive oil for a refreshing pesto. And I use it, of course, to make the uber-delicious mint chutney. But one of my favorite ways to use this divine herb is in this Mint Biryani With Roasted Mushrooms that I’m sharing today. 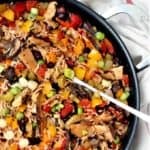 I used white basmati rice for the recipe, but you can go ahead and make it with brown rice, for some added healthiness. I have separate instructions on how to cook the brown rice. Also, use more mint if you’re using brown rice so that the herb’s flavor can stand up to the nuttiness of the brown rice. Heat the oil in a saucepan. Add the cardamom, cinnamon and cloves. When they sputter, add the rice and stir for a minute until the grains start to turn opaque. Add the water, and bring to a boil. Cover, lower the heat to low, and simmer for 15 minutes. If you’re making this with brown rice, change the proportion of water to 3 3/4 cups. 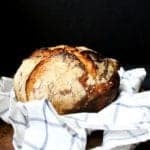 Once the water comes to a boil, cover the saucepan with a tight lid and bake in a 350-degree preheated oven for 50 minutes. Let stand for at least 10 minutes. 1 pound of white button mushrooms or crimini mushrooms. You can also go with a meatier mushroom like portabella or shiitake here. Toss the mushrooms on a baking sheet with 1 tsp oil, 1/4 tsp turmeric, 1/4 tsp red chilli powder and salt to taste. Roast in a 350-degree oven about 20 minutes or until the mushrooms are tender and beginning to caramelize, but not burned. In a large saucepan, heat 1 tbsp canola or other vegetable oil. 1 medium onion, sliced. Saute until it turns golden-brown. Add 1 tomato, diced, 1/2 tsp turmeric, and 1 heaping tbsp of garam masala. Stir and let cook until the tomatoes start expressing oil. Add the mint paste and stir and cook for about 10 minutes on medium heat. Add salt to taste. Now carefully add the rice to the mint, using a light touch so as to not crush the grains. Using a fork, mix the rice and the mint paste. Cover and cook for another 2 minutes on a very low flame. 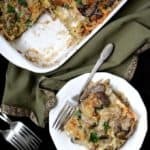 Sprinkle the roasted mushrooms on top. Biryani tastes especially delicious with a garnish of fried onions. To make this, heat 1/2 tbsp of vegetable oil and saute 1 medium onion, thinly sliced, and 1 tsp sugar. Turn off the heat when the onion caramelizes and turns a deep golden-brown. Nuts, tossed in with the onions in the last minute of cooking, or raisins or even roasted sunflower seeds make a great garnish for biryani. 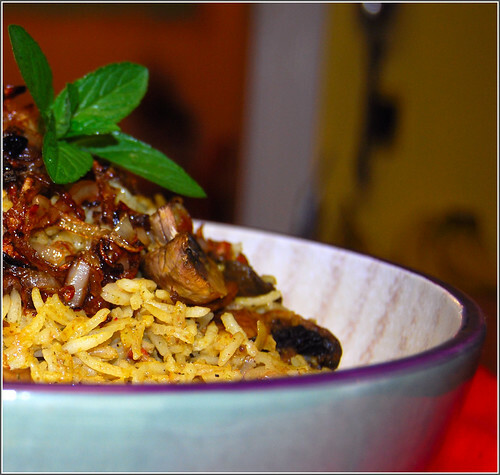 Mint biryani and roasted mushrooms, wat a combination…i too love mint leaves much…delicious dish! That looks delicious. My MIL uses mint to make veggie biryani and it is just awesome. Thanks for the info on durum wheat Vaishali. Will look for it in my Indian grocery. I too have mint in my garden from 5 years! Even winter, it stays well in CA weather. The biryani and mush , just make me hungry! Wow…that looks delicious. 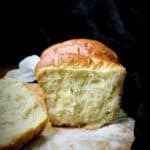 Its a wonderful recipe. delicious biryani.. i feel like having it right now. Wow, what a lovely patch of mint! I haven’t used mint in a lot of things, but am now feeling inspired. That dish looks wonderful! 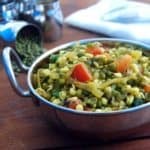 I just realized there’s so much more to the usual veg biriyani! Looks great.New recipe .I try various version of mint rice but with roasted mushroom the recipe is very innovative.Love it Vaishali. Absolute, delightful heaven.. Vaishali… I cannot speak anymore about my love of mushrooms! 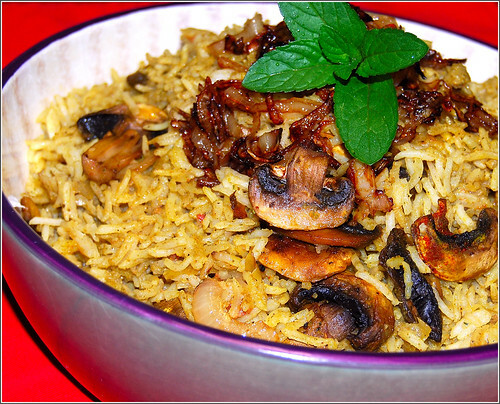 Biryani with mint & mushroom is something which i can really savor atleast a few time a week.. I have been growing mint in the pots indoors:-D Isn’t it great to have a fresh supply of this wonderful thing? Hi love mint too… I have to try this! fantasic! i made this last night, and Although I’ve never attempted a biryani before, this came out so delicious, I am hooked! I had to sub cilantro for half of the mint because my plant was so scrawny, but it tasted incredible. 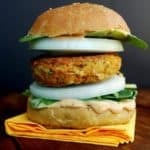 Your recipes are so amazing, I am so lucky to have stumbled upon them! Im a vegan who fell head over heels for indian food many years ago, but never thought I could cook it myself. I can’t wait to work my way through your amazing food! This is good stuff. I have never cooked with mint this way, and it’s a nice combination of flavors. 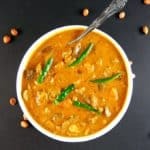 It makes me think of a commercial snack that has mint and chili and many other spices–the one with little noodles and dal and nuts and all kinds of crunchy stuff. I forget what it’s called, but I can’t have it any more, so this was a welcome reminder. One day, I swear, I will get a biryani to turn out nice and fluffy. The last two times I have added too much water out of fear of burning what’s toasting in the pan, which results in something more like porridge–totally the wrong texture. 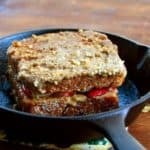 Next time I will bite the bullet and be brave about scorching, or at least remove the doggone pan from the burner! Still, it came out good, with a nice bite of heat that wasn’t overwhelming. 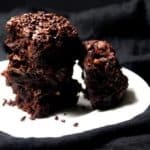 Thank you Vaishali for all these inspiring recipes. I made this today and it was delicious. I even used your cashew your cashew yogurt recipe instead of soy. So happy you liked it, Saheli!